Digital Photo Finalizer - Automatically improve and put the finishing touches on your photos (and the Lite Edition is FREE!). Fix Any Color - Make Pro quality selective color edits to your images. Fix/Improve the color of any objects in your digital photos. Digital Camera Poster Creator - Make any size poster from your digital photos using any printer or at any photo lab. 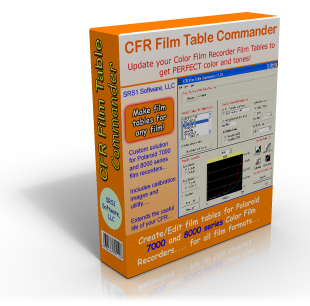 CFR Film Table Commander is a graphical, interactive software utility which allows you to view, edit and create Polaroid Color Film Recorder Film Tables (ProPalette 7000 and 8000 series). This gives you full command over the color output of your Film Recorder. CFR Film Table Commander includes a simple, step by step wizard for creating new film tables. It lets you view film table curves, and includes powerful tools for editing them. It even comes with a set of calibration images that you can use to help balance the color output of your printer. CFR Film Table Commander can be used for any type of film (black & white or color, slide or negative film, or even instant film), and supports all film formats (35mm, 120, 4x5). CFR Film Table Commander main window - This shows what CFR Film Table Commander software looks like. It lets you easily edit your film tables (or make new ones) so that the color output of your CFR can be just right. Other Minor Improvements - Other minor improvements were impelemented to make the program run more efficiently.